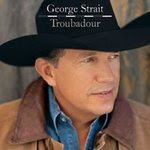 I keep telling myself that I’m going to contribute more to the blog, so I think this week’s release of George Strait’s new album Troubadour is a great reason to start. I’ve been a fan of George’s music for many years. I own close to 25 George Strait albums, including the box set, several Christmas albums, and even a couple of records (although I have no way to listen to them since I don’t own a record player). One of the things I enjoy doing after getting a new George Strait album is listening to each song and trying to predict which songs will be released as singles. In reality, I’m just picking my favorite songs and hoping they get some airtime. Unfortunately, I wasn’t really impressed by this album as a whole. The first major release off the CD is “I Saw God Today”, which you may have heard a few times already. It’s an ok song, mildly reminiscent of a song he released a few years ago called “The Best Day”, but I doubt it will make into my iPod playlist. Similarly, “Make Her Fall In Love With Me Song” sounds remarkably like “The Big One”, which was one of his hits off the Lead On album. This one, however, is a decent song worth checking out. And for those who love traditional western swing, then “West Texas Town” is a fun duet with Dean Dillon, who has written many of George’s hits. “River of Love”, though, is a far cry from the traditional country sound I generally expect from George. In fact, I think George has been hanging out a little too much with Jimmy Buffett. Now don’t get me wrong, I’m a Jimmy Buffett fan (Emily and I saw Jimmy, George, and Alan Jackson at Texas Stadium a few years back), but the song just doesn’t fit George. It is interesting, however, that several of the songs on this album were recorded at Jimmy Buffett’s recording studio in Key West. I have a feeling that the title track, “Troubadour”, will be released as a single. That song, as well as “House With No Doors”, sound the most like the singles from his previous few albums. I think they will fit in with what you might hear on any mainstream country radio station. Overall, I give the album a “B”. I was happy to hear the steel guitar featured on several of the tracks, but I wasn’t able to pinpoint any song as a potentially huge hit. I’ll probably put “Troubadour” and “Make Her Fall In Love With Me Song” into my regular rotation, but for now I’m gonna stick with the classics. I would like to add that not only do you enjoy picking the singles, you are usually eerily accurate. It is also eery when you voice the same sentiments Simon does on AI about 10 seconds before they come out of his mouth. Perhaps you missed your calling? in mind of. I say to you, I definitely get annoyed even as folks consider issues that they plainly do not recognise about.